HISD’s Read Houston Read program will soon kick off its fourth school year, and volunteers are needed once a week to read to a first-grade student — either in person or online. The goal of Read Houston Read is to instill a love of reading in children, while giving Houstonians an opportunity to give back to their community. The program is part of the district’s Literacy by 3 movement, which aims to have all students reading at or above grade level by the end of third grade. If you have friends or family who might be interested in volunteering, encourage them to sign up at this link. All volunteers are required to pass a background check each year and attend a training session, which is online. From there, volunteers can pick a participating school and schedule weekly sessions with a student. Optional Experienced Volunteer Refresher Trainings will be held on Thursday, Sept. 7, 2017. Please click here to sign up for the 1:30-2:30 p.m. session or the 3-4 p.m. session. Volunteers will receive an email as soon as campus volunteer opportunities are available, which should be the beginning of October. This entry was posted in Literacy, News, Read Houston Read, Volunteers and partnerships and tagged Read Houston Read on August 7, 2017 by HISD Communications. March is National Read Aloud Month, and Barbara Bush and her son Neil were at Walnut Bend Elementary School on March 2, 2016, to bring attention to the annual observance. The Barbara Bush Houston Literacy Foundation has joined forces with HISD and 14 other Houston literacy organizations to increase awareness of the importance of reading to children so that they can learn, grow, and succeed. This entry was posted in District VI - Holly Maria Flynn Vilaseca, Early Education, Literacy and tagged Barbara Bush Houston Literacy Foundation, Legacy Community Health, National Read Aloud Month, Read Houston Read, Walnut Bend ES on March 2, 2016 by HISD Communications. Would you like to volunteer for Read Houston Read? Sign up for Read Houston Read by clicking here. Show your support by downloading the attached badge and add it to your Facebook page or share it on Twitter. The turkey has been eaten, the pies are gone, and the day set aside for American families to give thanks for the blessings in their lives is over. Now it’s time to give back. “Giving Tuesday” on Dec. 1 is an annual global day for giving back to the community through service, as well as celebrating generosity in all its forms. The idea is simple: Give of your time and/or your money and inspire others to do the same by telling them about it. Use the hashtag #GivingTuesday on social media to let everyone know how you are helping to make change. Consider giving to the Houston ISD Foundation to help build a future generation of educated adults who are prepared to serve as tomorrow’s leaders. HISD’s Read Houston Read volunteer program is another great way to give back to your community. Read to a first-grader and give them a gift that grows exponentially in value — the love of reading. Read Houston Read is part of HISD’s Literacy by 3 movement, which calls for every child to be reading on or above grade level by the time they leave the third grade. Sign up for up to an hour each week, either in person or virtually, to mentor a child by reading to them and listening to them read aloud. Then use #GivingTuesday on Twitter or download this badge on Facebook to tell everyone about your service. If you can’t make the weekly commitment, there are plenty of other ways to volunteer in HISD. Register through VIPS and discover campus-based opportunities to get involved. 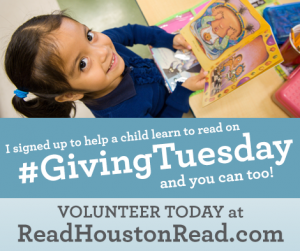 This entry was posted in Literacy, Read Houston Read and tagged Giving Tuesday, Read Houston Read, VIPS on November 30, 2015 by HISD Communications. In this week’s I Am HISD, which features district students, graduates, employees, and other team members, returning volunteer Sharon Plummer discusses how she and her husband first discovered the Read Houston Read program, why they both immediately signed up to participate, and why they can’t wait for this year’s first mentoring sessions to begin. I understand you and your husband, Chandler Davidson, both volunteer as reading mentors at Burnet Elementary School through Read Houston Read. How did that arrangement come about? This entry was posted in District VIII - Diana Dávila, I Am HISD, Literacy, Read Houston Read and tagged Burnet ES, Read Houston Read on October 7, 2015 by HISD Communications. Former Houston Oiler quarterback Dan Pastorini was accustomed to passing a football on the field. Now, he passes on knowledge and a love of reading by volunteering to read to a child. Pastorini and gridiron legend Charles Alexander joined The Barbara Bush Literacy Foundation, Lone Star Sports and Entertainment, and Phillips 66 at Walnut Bend Elementary School on Aug. 31 to help kick-off National Literacy Month. This entry was posted in District VI - Holly Maria Flynn Vilaseca, Elementary Schools, Literacy, Read Houston Read, Volunteers and partnerships and tagged Read Houston Read, Walnut Bend ES on September 1, 2015 by HISD Communications. All year long, caring volunteers from across Houston have been helping HISD students read by simply going online. But on May 29, students at Paige Elementary School got to meet their mentors in the flesh. TutorMate is a web tool that allows mentors to tutor students via the internet. It was incorporated into HISD’s Read Houston Read program as a part of its Literacy By 3 initiative, which aims to have every child reading well by the end of Grade 3. 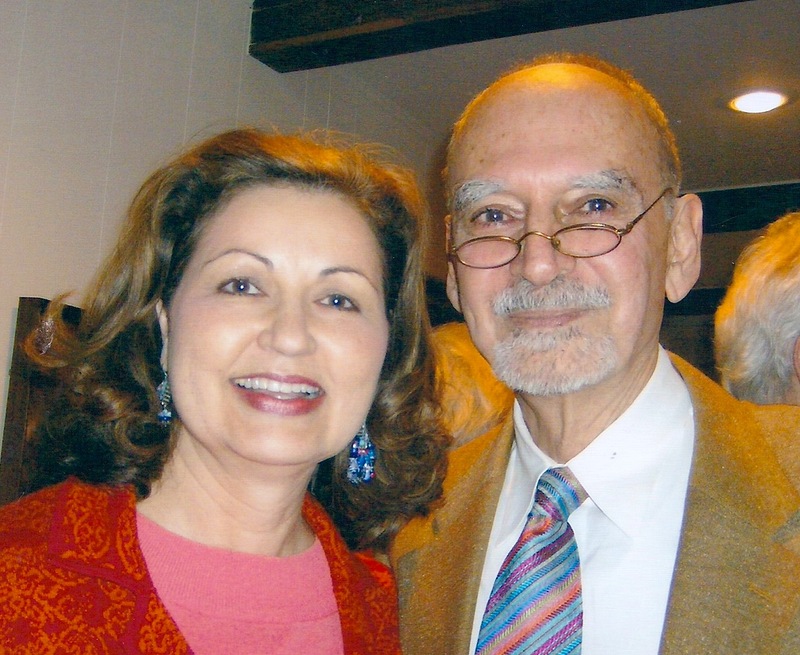 This entry was posted in District II - Rhonda Skillern Jones, Elementary Schools, Literacy, Read Houston Read, Volunteers and partnerships and tagged Literacy By 3, Paige ES, Read Houston Read, Rhonda Skillern-Jones on June 4, 2015 by HISD Communications. In 71 hours, a person can ride a bicycle from Paris, France, to Brest and back or complete 48 orbits of planet earth. For Mimie Taylor, who was honored at Thursday’s Read Houston Read Volunteer Appreciation Breakfast, those 71 hours were best spent helping first-graders improve their reading skills at Garcia Elementary School. “Tuesdays and Thursdays are dedicated to Read Houston Read and my scholars,” said Taylor brightly. This entry was posted in District I - Elizabeth Santos, District II - Rhonda Skillern Jones, District III - Sergio Lira, District IV - Jolanda Jones, District IX - Wanda Adams, District V - Sue Deigaard, District VI - Holly Maria Flynn Vilaseca, District VII - Anne Sung, District VIII - Diana Dávila, Read Houston Read and tagged Read Houston Read on May 14, 2015 by HISD Communications.